Biologist Jürgen Otto and colleagues have named two species of the extraordinarily colourful dancing spiders. It is only a few millimetres in size, performs a dance as part of a courtship ritual and has striking coloured markings on its back that “look like a pharaoh’s headdress”. 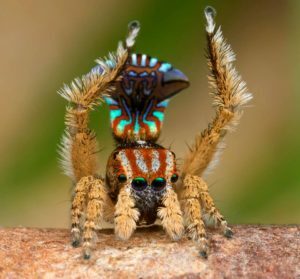 But when biologist Jürgen Otto first spotted the peacock spider species he has named Maratus unicup, he didn’t immediately recognise how special it was. “I didn’t think much of it because I’m partially colour blind,” he says. 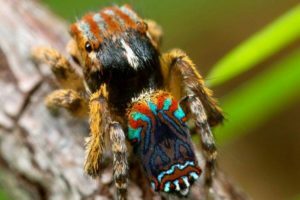 “But there was quite a reaction to photographs of it on the internet, with people saying it’s beautiful.” Maratus unicup is one of two new peacock spider species Otto and his colleague David Hill have named in a new paper published in the international spider journal Peckhamia. Otto discovered the spider near Lake Unicup in Western Australia last year. He said the new species was notable for its courtship display in which the male dances – swinging its abdomen from side to side – while the female watches from a close distance. 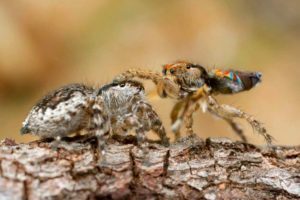 The second species they have named Maratus tortus and was discovered by environmental consultant and educator David Knowles in 1994 near Walpole in WA. Knowles and Otto have returned to the site several times and were finally able to capture specimens of the spider last year. Knowles had originally nicknamed the species “hokey pokey” because of the male’s curious twisting dance. “There’s no other peacock spider that has this kind of a display,” Otto said. “It looks almost like a Spanish bullfight, where the female is the bull and the male is the bullfighter.” In the new paper, Otto and Hill say there are now 70 species of peacock spiders, the majority of which have been named by them during the past seven years. Credit: Biologists Jurgen Otto and David Hill. Wildflowers and Orchids are springing up everywhere. Enjoy a spring break in the beautiful Walpole Wilderness Area.